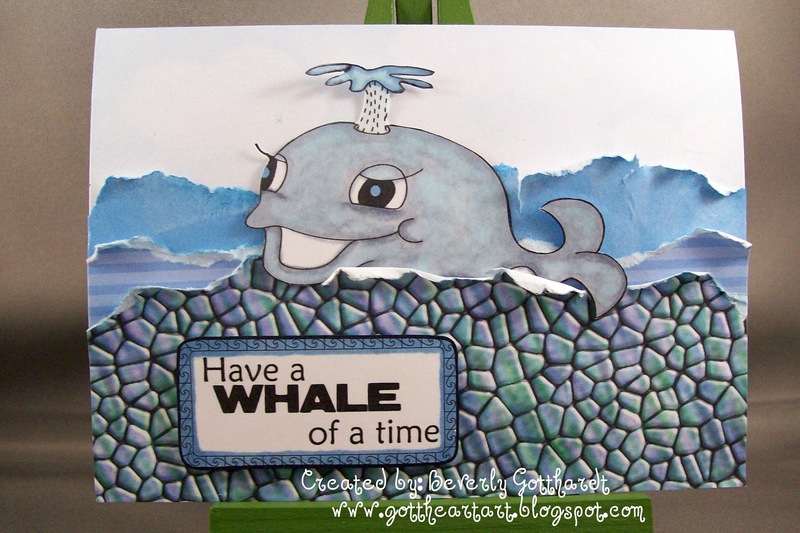 I'm very honored today to bring you 2 cards for the Quirky Crafts Challenge 8. Two weeks ago I played there for the first time and low and behold they picked me to be one of the Guest Designers on their blog for this fortnights challenge. What an honor for this Texas gal to be chosen to be Guest Designer on a blog in Australia. Thank You so much girls. I do have to apologize for this late post, I couldn't seem to get on Australian time today. The sponsor for this week's challenge is Digital Delights by Louby Loo. They were so generous and sent us all this cute Under The Sea set of digis to play with for this challenge. When you hop over to the Quirky Crafts Challenge to participate you will see all the different takes on this challenge using these digis. That's one of the great things about digis you can size them any size you like to be used on cards or scrapbook pages. They are very affordable also. 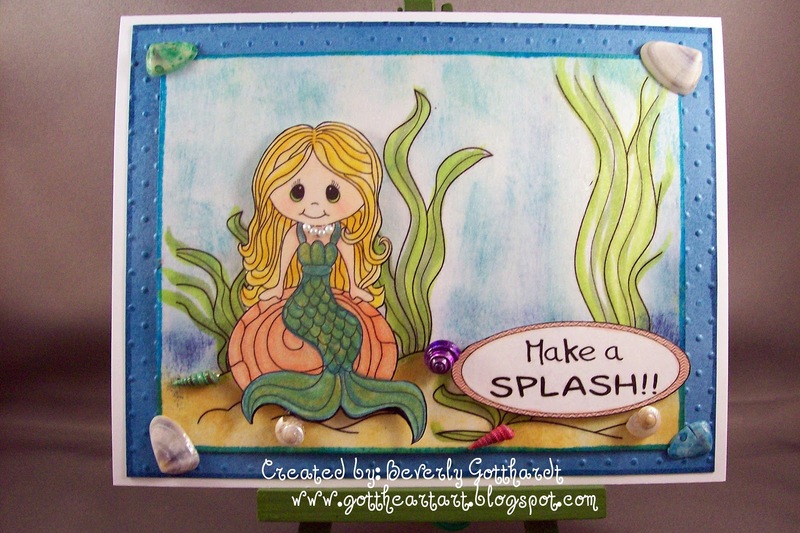 The first card I used the sea background, the little mermaid, and one of the sentiments. I'm still sponging like crazy and that's how I achieved the water going up in the background. I also sponged the sand. I printed the little mermaid and sentiment separate. I colored everything else with Copic Markers except for the mermaid's fin dress which I colored with SU Metallic Art Pencils and blended with Gamsol. 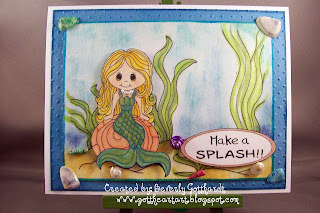 After I cut out the mermaid and sentiment I popped them up and mounted the scene on a mat that I ran through an embossing folder. I glued on the shells and her pearl necklace and then sprayed the whole thing with a product called Goosebumps by Tsukineko. It's called a clear texture spray and it makes the whole thing look like it has water on it. It's a shame you can't pick that up in the photo because it's really a cool effect. I hope you'll all hop over and give Quirky Crafts Challenge a look over and join in on the Under The Sea Challenge fun. Not only can you enter, but you can also vote for you favorite entry on June 17th and 18th. Come on over and take a dip. Supplies: White Card Blanks 5" X 6 1/2" and 4" X 5 1/2" Halcraft, Papers: SU Marina Mist, Whisper White, Pattern Paper unknown, Stamps: Digis-Digital Delights by Louby Loo, Ink: Copic Markers, SU-Marina Mist, Ranger distress inks, Cuttlebug embossing folder-Swiss Dots, Goosebumps clear texture spray, Recollections-pearl stickers, shells-Hobby Lobby, SU dimensionals, Scor-Tape. This is so cute - I saw it at the Quirky Crafts blog! Great theme! Thank you so much Bev for joining us over at Quirky Crafts! We loved your winning card andthese cards are fabulous! !